7 Responses to "Ethiopia’s security crisis shifting to north central parts of the country"
We were outraged when Takele Uma handed out Addis Ababa ID cards to new transient ODP supporter Oromos. As if that was not enough currently we are starting to hear about the Somali region President giving ID cards to foreigners that speak Somali language that wish to join his political party. According to this new accusation the Somali regional president is handing ID cards to foreigners from Somalia to cover the fact the displaced Oromos are placed around Addis Ababa given Addis Ababa ID cards . Basically the Somali regional President is trying to cheat the census and let people think that the displaced Oromos are back in Somali region while the fact is they are around Addis Ababa. The new addition of the Somalia foreigners number is hoped to offset the number of Oromos that were displaced from the Somali region currently placed in Addis Ababa area by team Lemma. The team Lemma is giving blind eye to this accusation as the Federal Census Bureau is too. You would like the government to fail and the country to fall apart, wouldn’t you? You must be one of those whose interest is affected by the positive change in the country. Perhaps you can’t ask for a bribe anymore. Try all you want. You won’t succeed in spreading falsehood. This media is a racist media. This media’s sole goal is to tarnish the name of oromo activists and political organizations. How did you prove that OLF is operating in this area? Like usual, you blame everything on OLF, biased racist media. Brainless stupid journalist, the Amhara regional special forces were being brought to the Oromo zone one week before this conflict and it clearly in the social media that this newely trained groups were instigating conflict with ANM, they foolishly tried to attack the oromo zone people amd when they were bitten, they blamed on OLF. Last time when they tried to kill Kimant and bitten again, they blamed on TPLF. What now? and moron media like you are also twisting the truth and.blaming OLF. 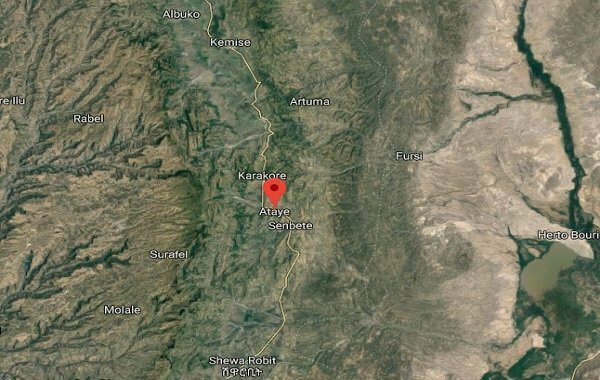 How is it possible armed forces of OLF go to Kamise without being noticed when there is no border between the oromia and the zone. You can tell this lie and fake twisted news to baby brain like you and brain wash them. Why you did not dare to criticise the ANM memebers who openly instigating the conflict on social media and after people are killed they claim that the kiilings will benefit the Amhara. You did not even mention this in your reporting when it is clearly and directly related with this conflict but you travel hundreds of miles, digging ditches and try to relate OLF civilian leaders and armed leaders separation to this. How on earth does OLF can come to Kamise passing this lasrge land if Amhara region without beimg noticed. You have little brain and you think that our brain is also as little as yours. Ya, ethnic politics (racism) in action. Wise people were warning now and then that ethnic politics (racism) is tearing apart this country, but most of our elites do not care as they are safe in foreign nations, Europe, the US, and Australia. It is the poor, the jobless, ill-informed who dies. Unless a hero comes out and declares a state of emergency and bans ethnic politics (racism) and dismantle ethnic federalism, this ancient country will disappear into the thin air (God forbid). Every Ethiopian who has some sense should fight this Satan (ethnic politics)! May the Creator help this country!! I wish all Oromos could think like you! We can not deny crystal truth that the massacre on innocent civilians at Ataye and the surrounding is part of OLF long time hatred for Amhara and Ethiopia in general.The respected Abbaa Gadaa leaders informed ahead of time and gave the news about the presence of heavily armed OLF military forces at Ataye and Kamisse during the reconciliation process.Dr Abiy himself knows that OLF militants were plotting to assassinate him and he avoided trips to West Wolega for his own safety reason not to be assassinated by OLF fighters that he got intelligent evidences. It is high time that the Amhara regional state and the federal government protect those citizens at those places mentioned by Abbaa Gaada that OLF fighters are strongly l organized and camped.There is no more drama as the so called North Army chief lied about the presence of outside forces in Ataye and surrounding unless he want to defend those native Oromos enrolled by OLF to massacre re the native Amharas as they began at Ataye the precious week.